SDL uses OnEventChanged notification to appropriately manage the hmiLevel and audioStreamingState of each application during an active event. Send notification with appropriate parameter value when active call on HMI has been started/ended. Send SDL.OnAppDeactivated to the active app when the phone call is started. Resume the applications to their original state prior to the phone call event in the HMI when the event ends (see note below). SDL does not send BC.ActivateApp or BC.OnResumeAudioSource to HMI after the phone call is ended. EMERGENCY_EVENT is an HMI-specific event used when "Emergency event" or "Rear view camera" are active. The main idea of this from the SDL<->HMI point of view is that navigation/audio streaming mustn't interfere with Rear Camera View mode. The HMI is responsible for managing audio/video data while EMERGENCY_EVENT is active. Send a notification with the appropriate parameter value when EMERGENCY_EVENT becomes active or inactive. While the event is active, the app is not allowed to stream audio and it will not be heard by the user (due to other audio and/or system events blocking it). Send notification with appropriate parameter value when all apps should be deactivated/restored. Send OnEventChanged(DEACTIVATE_HMI, isActive: false) before activating an app. 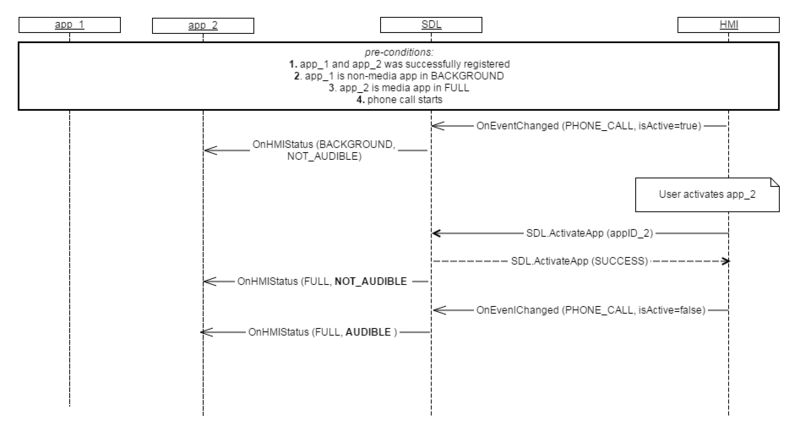 When this event is active, SDL rejects all app activation requests from the HMI. Send notification to SDL with appropriate parameter value when embedded navigation or audio source is activated/deactivated. 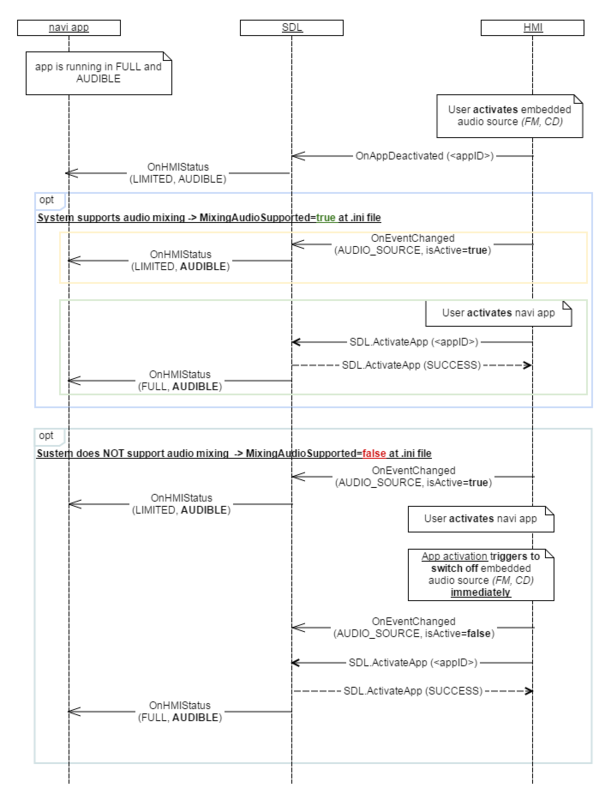 Send SDL.ActivateApp(appID) in case of app activation or BC.OnAppDeactivated(appID) in case of app deactivation. 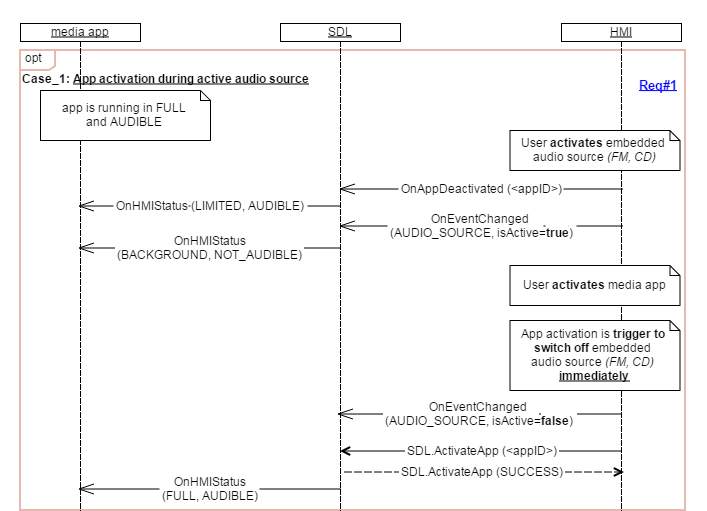 The HMI must deactivate the AUDIO_SOURCE event if a media app is activated. 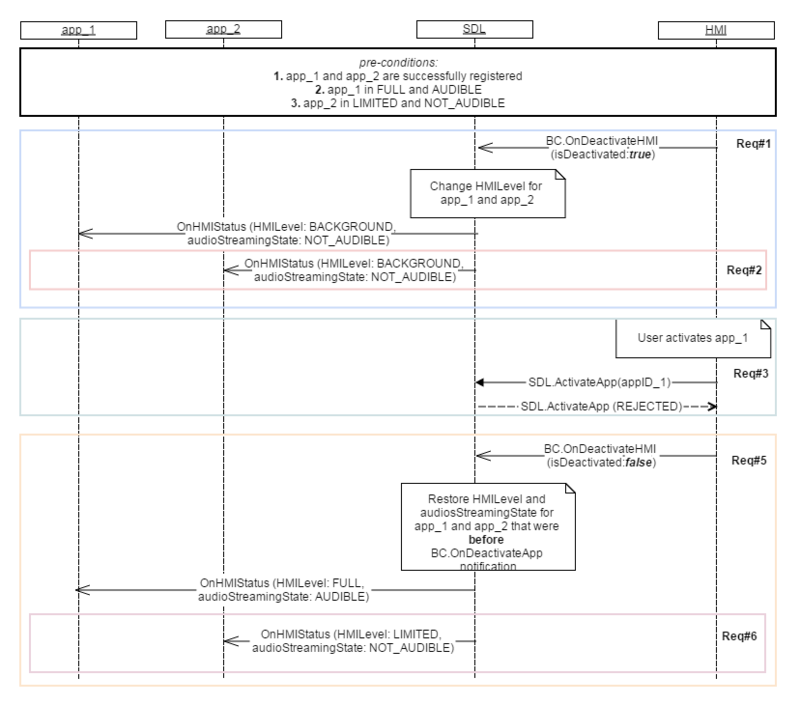 The HMI must deactivate the EMBEDDED_NAVI event if a navigation app is activated. Send TTS.Started to SDL to change media app currently in (LIMITED, AUDIBLE) to (LIMITED, ATTENUATED) due to active embedded navigation. 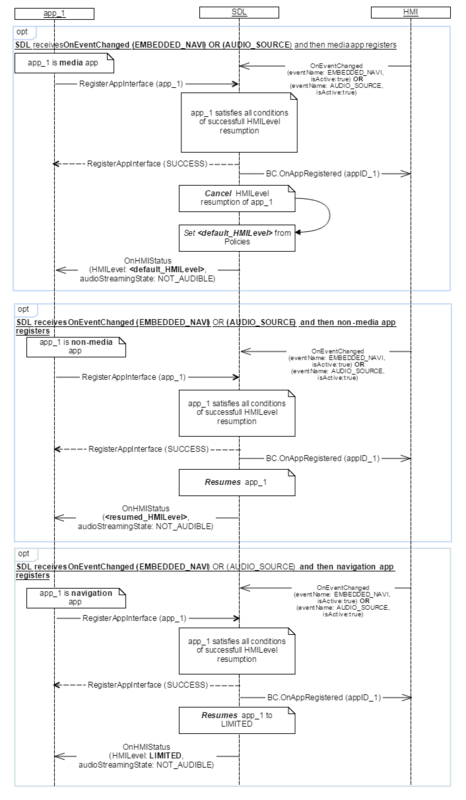 Send TTS.Stopped to SDL right after embedded navigation stops streaming to change application's HMIStatus to the same state it had prior to the event. 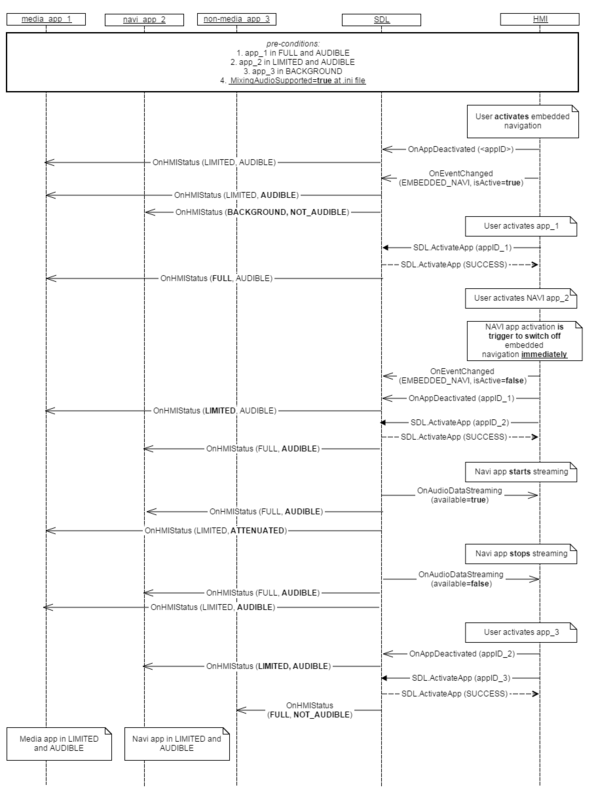 When app is successfully registered and SDL receives OnEventChanged(AUDIO_SOURCE, isActive:true) or OnEventChanged(EMBEDDED_NAVI, isActive:true), SDL changes hmiLevel and audioStreamingState of this application. 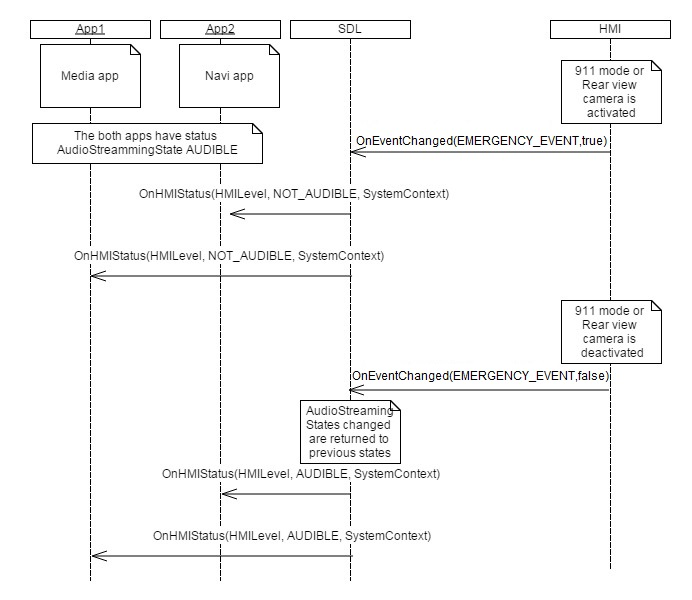 When app is activated during an active EMBEDDED_NAVI or AUDIO_SOURCE event, SDL sets the appropriate hmiLevel and audioStreamingState for the app. 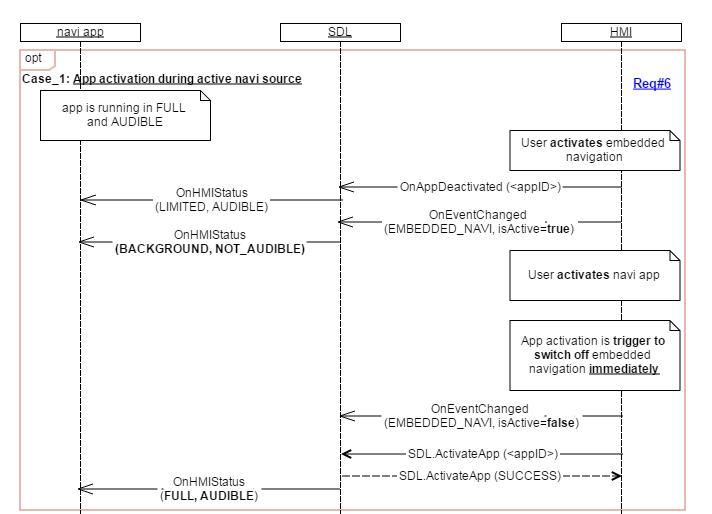 If there is a navigation app that is in (LIMITED, AUDIBLE) due to an active AUDIO_SOURCE event, and SDL receives SDL.ActivateApp(appID_of_navigation_app), then SDL will change the navigation app's state to (FULL, AUDIBLE). If SDL receives OnEventChanged(EMBEDDED_NAVI, isActive=true), SDL changes any media app in (LIMITED, AUDIBLE) to (LIMITED, ATTENUATED). After the EMBEDDED_NAVI event ends, SDL changes the media app's state to (LIMITED, AUDIBLE).